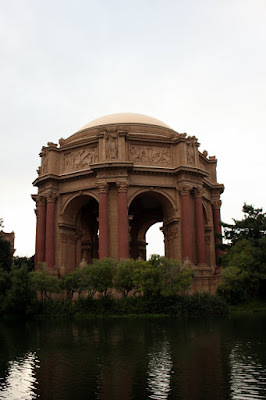 The Palace of Fine Arts - where Sonnet and I married August 24, 1996 - my adult life begins. Today, as then, it is foggy which adds to the beauty of the place - the weather rolls in from the Pacific through the narrow gateway passing the Golden Gate Bridge not far away. Magic. So here it is: built in 1915 for the Pan Pacific Exhibition by Bernard Maybeck - there are a number of Maybecks in the North Berkeley hills, including across the street from my parent's house. Maybeck took his inspiration from the Roman and Greeks while the sculptured frieze and allegorical figures found about represent Contemplation, Wonderment and Meditation (the plaque tells me). The lagoon BTW meant to echo classical settings in Europe, where the water provides a mirror surface to reflect the grand buildings. Rome. eucalyptus trees fringe the eastern shores lending their unique perfume. There are lots of swans, ducks and geese, which get in the way of my photo so.. I.. am.. patient. High school friend Dan and I see each other for lunch before I head to SFO. Dan lives in Bernal Heights with wife Liz and two daughters; he did a total remake of his house .. by himself. I am way impressed by the open design and high quality spec. I wish I could do such things but never gonna happen - even after summers of house painting in college. It is all about confidence, we agree - being comfortable taking a crow bar to wood and causing destruction; having faith you can make it better. I had dinner with Dan several months ago at La Caprice in Mayfair when he was writing about Fergus Henderson, who found our favorite London restaurant St John's. Sonnet scratches the car; Eitan from the back seat: "Are you going to tell dad?" Madeleine: "I had a bad dream once. Running up the stairs and finding a tarantula. Like, a giant one." Madeleine: "You know that kid Alex in my class? He's addicted to video games."